Edward Blum: We won’t be used for your racist agenda! Cross-posted from 18 Million Rising. Edward Blum is really, really invested in Asian Americans getting into college. Sounds like a good thing, right? Think again. And now, he’s cherry-picking data and appealing to conservative racial ideals to rope in Asian American students to be a political wedge against affirmative action – most recently by filing admissions discrimination lawsuits against Harvard University and the University of North Carolina. Even worse, this strategy aims to divide and conquer People of Color by pitting Asian American students against other marginalized college hopefuls. If there’s anything Blum is banking on, it’s the myth of the Model Minority and Asian Americans’ silence about his racist agenda. We must refuse to be used as a political wedge in Blum’s racist agenda. Not only is Blum intentionally exploiting the Model Minority myth by suggesting that the challenges of race can be overcome merely by hard work, but he also claims race-conscious considerations are actually hurting Asians by passing us up in favor of Blacks and Latinos. Blum claims to be protecting the interests of Asian Americans by fighting to end affirmative action – despite the fact that 76% of Asian Americans say they support the policy. And the truth is, many Asian Americans (especially Southeast Asians and recent immigrants) benefit greatly from affirmative action. Edward Blum doesn’t have our best interests in mind – he only has his racist calculations in mind. And it’s not as though Blum is trying that hard to hide his racist, anti-affirmative action shenanigans. He’s currently a fellow at the American Enterprise Institute (AEI), the fervently conservative think tank that uses selective data and pseudo-intellectual rhetoric to push policies that reinforce the status quo. Paid by and working for the AEI, Blum is invested in nothing more than making sure that conservative power remains consolidated and protected – and if Asian Americans play into his calculated, manipulative divide and conquer game, this is exactly what will happen. 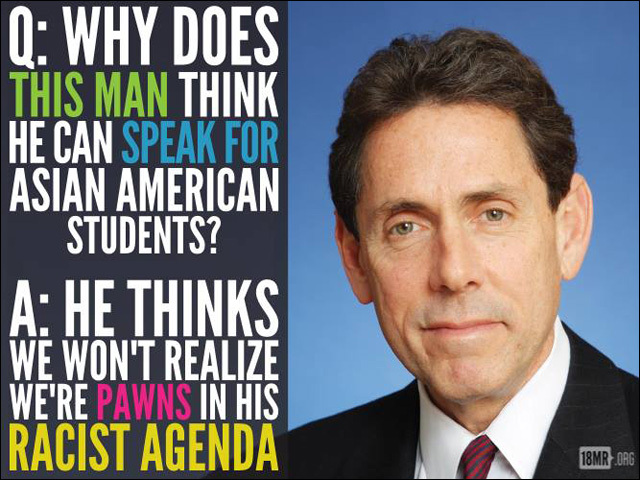 Expose Edward Blum’s racist tactics and tell him we won’t be his Model Minority minions. Support affirmative action today. Sign 18 Million Rising's petition here.